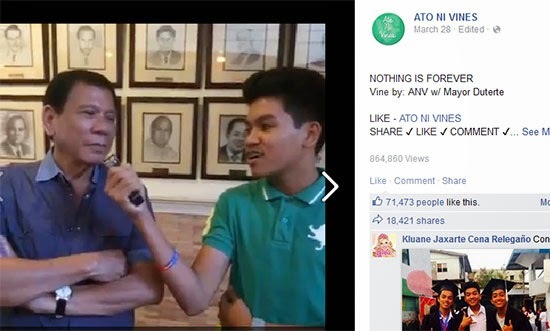 ATO ni VINES - a group of three young Cebuanos namely Matt, Lenarr and Arjay does funny videos and upload it to their Facebook account has gained many followers because of the entertaining videos they make. There's this certain video where the group interviewed Davao City Mayor Rodrigo Duterte that is now trending all over the internet today. Arjay asked in Visayan dialect, "Sir, unsay ma ingon nimo sa pag-leave ni Zayn Malik sa One Direction? [Sir, what can you say about Zayn Malik leaving One Direction?]" Mayor Duterte answered briefly, "NOTHING IS FOREVER!!" This mini interview gained 863,791 Views as of this writing since it was posted last March 28, 2015. According to an interview made Matt says that they were afraid to approach Mayor Duterte at first but fear had vanished instantly when they saw how gamely the Davao Mayor answered on their interview. Comments or suggestions about "Mayor Duterte to Zayn Malik - 'Nothing is Forever'" is important to us, you may share it by using the comment box below.